The world’s attention has been fixated on London for the last sixteen days as the Games of the 30th Olympiad have unfolded. More than ten thousand athletes from 204 nations competed in the pinnacle of sport, with 302 Olympic gold medals up for grabs. There’s been a back-lash from so called experts about the short-comings of Australia’s Olympic team this year. There’s no doubt it would have been amazing to have snagged a few more gold. If we had of turned a third of our silver medals into gold we would have finished sixth on the medal tally - but we have to remember this is the BEST of the BEST. The Australian team still did a spectacular job to finish in the top ten. With four more years until Rio our professional athletes can be spurred on to do even more in South America, and hopefully the legacy of London encourages more Australians to take up a sport. But before looking forward to the 2016 Olympics, lets consider some of the moments that defined this year’s event. 10. “Olympics, London Olympics” – The opening ceremony was a spectacular showcase of British music and culture. The closely guarded secret of how the Queen would arrive at the venue was without doubt the highlight. James Bond parachuting her majesty into the Olympic stadium has to be the most sensational arrival of a head of state ever. 9. “Mo’ Running Mo’ Problems” – Long distance runner Mo Farah became the first man to win both the five thousand metres and the ten thousand metres in front of a home crowd. It was just one example of the boost the local Olympics provided for the host athletes. 8. “Get out of Gaol Free Card” – Korea Republic’s football team was promised that a bronze medal win over Japan would spare the team from compulsory military service. In a spiteful match against the blue samurai the Korean’s did enough to avoid conscription by winning the medal - their celebrations after the match said it all. 7. “Ye Yeah” – China’s Ye Shiwen exploded onto the world scene with a spectacular swimming campaign - setting two Olympic records and a world record in the individual medley. The teenage sensation claimed both Medley Gold medals and raised eyebrows in the process - swimming her final freestyle leg in the 400-IM faster than American Ryan Lochte who took out the men’s gold. A sensational, and controversial effort. 6. “Riding on a High” – Australia’s sailing team saved our bacon. The best performing sport at the London games provided three gold medals and a silver to ensure our proud sporting nation would sneak into the top ten. There was a lot of hype about the golden efforts of our team in the laser-class, 49ers and 470’s but it was the women’s effort in the six meter Elliott that was the stand out. It was a feisty and frenetic final match-race laden with penalties and a skipper overboard. The tenacious Australian trio claimed silver in what was one of the most exciting duels of the sixteen-day tournament. 5. ‘”Sally Pearson Wins by a Whisker” – As world champion and hot favourite Pearson was expected to win gold in the women’s hurdles. The Australian shouldered that expectation to win by the smallest possible margin ahead of USA’s Dawn Harper – clinching the only gold for Australia’s track athletes of the games. Teenager Steve Solomon also deserves a special mention. The youngster was hammered for his selection in the 400 metres but showed the entire world why he deserved to be there, qualifying for the final and running the best leg of all Australian runners in the 400 relay. 4. “Jessica Ennis’ Heptathlon Homecoming“ – It was London’s Cathy Freeman moment. As poster child of the games Ennis was under enormous pressure to perform. She was one of the first athletes to run on the Olympic track and her welcome was decibel shattering. The home-town hero managed to delight the London-faithful claiming gold and parading the union jack around the stadium for an unforgettable lap of honour – the first of many for the host nation. 3. “The Velodrome Ashes” – It was a lazy journalists dream - Australia versus the old enemy Great Britain on the boards. The main duel was between world champion Victoria Pendleton and Australia’s great hope Anna Meares. The duo faced off in the Keirin and the women’s team sprint, and split their efforts with a gold medal each. The two who have been dubbed mortal enemies shared kind words and congratulations at the end of their absorbing final clash. The mutual respect perfectly captured the Olympic spirit. 2. “Thunder Strikes Thrice” - Usain Bolt used the London Games to confirm that he is without doubt the greatest sprinter of all time. Case closed. The Jamaican became the first man to defend his Olympic gold medals in the one hundred and two hundred metres in back to back games. Bolt sealed his spectacular Olympic effort by winning the four by one hundred meter relay in world record time. His runs were awe-inspiring, his pre-and post race celebrations befitting of one of the greatest entertainers in the world. 1. 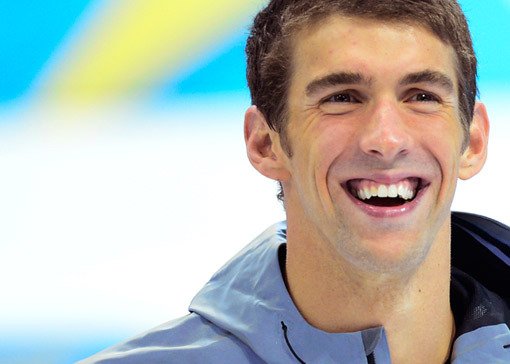 “Like Mike” – There has never been, and may never again be an athlete like America’s Michael Phelps. The man nicknamed the ‘flying fish’ became the most decorated Olympic athlete of all time after he claimed four gold medals in the pool at the London Games to take his overall gold tally to an immense 18. The peerless swimmer drawing his amazing career to a close in the most impressive of circumstances.